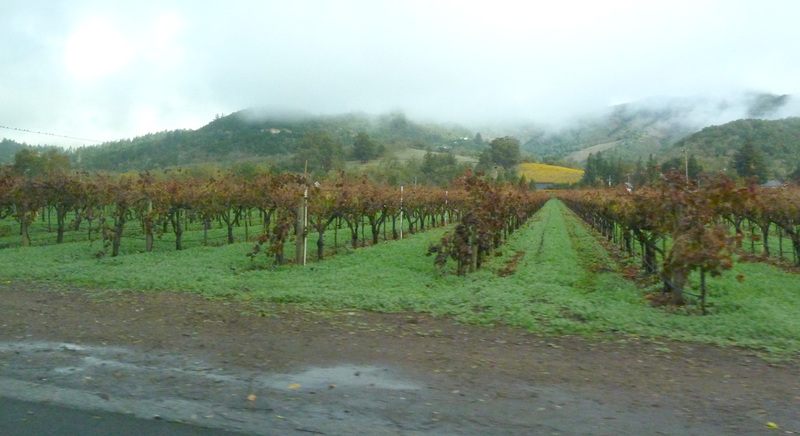 As I may have alluded to earlier, I spent the day after Thanksgiving touring California wine country. Not for the wine, though. Part of the plan in spending T-Day down there was to soak up some of the local suds. My top targets were Bear Republic, Russian River and Lagunitas. This was determined to some extent by the map. From where we were staying in Winters (not far from Davis), the map seemed to suggest my primary targets were not all that far apart. The trip in from Winters took longer than I thought it would. 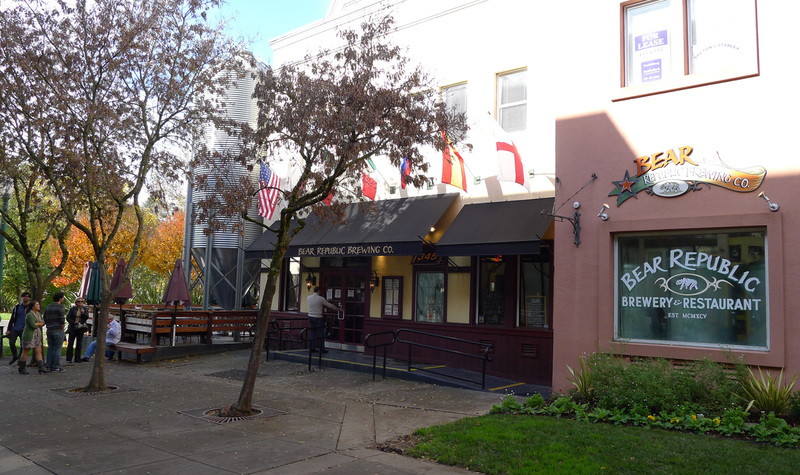 Bear Republic Brewing, the northern-most of the target breweries in Healdsburg, wound up being the first stop on account of when they opened. Lagunitas was the more logical first stop, but they wouldn't be open when we got to Petaluma, according to their website. It turned out they opened earlier than advertised that day. Silly me for believing what I saw on the web. Healdsburg is a very cool place. Lots of shops up and down the main street area. We arrived 15 minutes or so before Bear Republic opened. 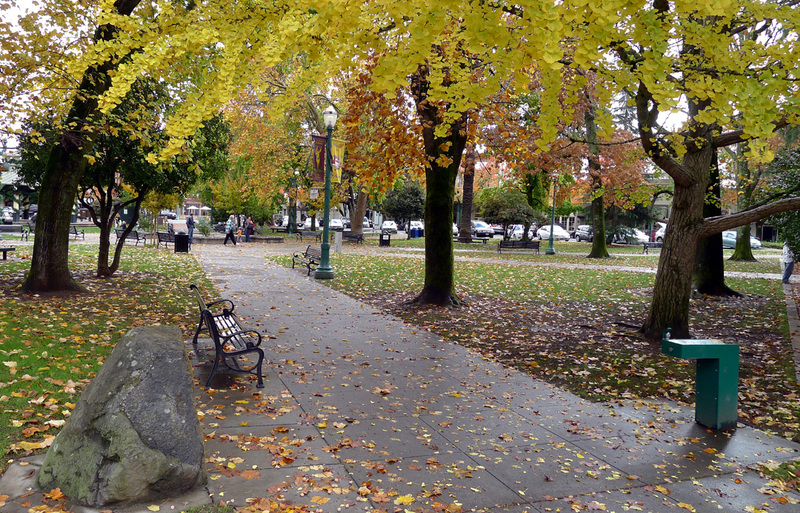 I loitered in front of the pub for a few minutes and took some pictures, then stalked across the street to a park where leaves were falling in the face of Christmas decorations. The Bear Republic pub is a nice space, with high ceilings, a long bar and plenty of table seating. They have a patio area that undoubtedly fills up nicely in the warmer weather. It was enclosed with the kind of clear vinyl you see around Portland during the cooler months...which is to say most of the year. By the way, they appear to have a substantial production facility just north of the pub. There's no way they could support the demands of the pub and their distribution with the brewery in the pub building. There's a brew kettle and mash tun near the bar. They are mostly for show, I'd say, though it looks like they are being used, probably for small batches. We sat down at a table and ordered a taster tray that included pretty much everything they had available...the standard house ales and the seasonals. It was lunchtime and food was in order. The menu choices are typical of what you find in most pubs, though there are some higher end items. Most of the standard Bear Republic beers are well known to me. Red Rocket and Hop Rod Rye are old favs and I've brewed clones of each more than once. XP Pale Ale is a nice light ale, prefect for warm weather. Racer 5 is a serviceable IPA, although it has become somewhat pedestrian due to the hops arms race we've seen over the last few years. All of the beers from the standard list were excellent. Peter Brown, a brown ale I was not familiar with, was quite nice. I'm not a stout fan, but Big Bear Black was excellent. The rest were true to form. In short, the house beers, which also enjoy pretty wide distribution, seem to be pretty refined. No surprise there. They've had plenty of time to tweak and refine these recipes through the years. The seasonal beers were disappointing by comparison. I liked Tartare, a low alcohol, vaguely sour beer based on the Berliner Weisse style. Cher Ami, a fruity, spicy Belgian-style ale wasn't bad. Mach 10, a double IPA (100+ IBUs and 9.2% ABV) I've had on draft in Portland, features a megaton blast of hops. Indeed, none of these beers were bad. They just seemed unfinished next to the standards. It makes sense, somehow. The food was just okay. Soggy fish in the fish and chips. Fries that weren't especially hot when they arrived. A bland burger. I don't like to form an opinion about a pub's food based on a single visit. These guys had just opened and were getting ready for a busy lunch. I'll cut them some slack for now. When I look at Bear Republic, it's very similar in feel to some of my favorite places in Portland. It's probably a little larger, which makes some sense. The most important point is that the standard beers are really terrific. I'll have some thoughts on that in future posts. Healdsburg seemed like a tourist-trap hell to me, and much as I love Bear Republic's beers, the pub fit the hell category pretty well too, right down to stocking the place with fake brewing equipment. We hit it after Lagunitas and Russian River, so maybe it just suffered in comparison and isn't such a bad place, though your description of the food doesn't inspire me to seek it out a second time. Maybe Healdsburg was quiet that day. It didn't seem bad to me. Some of the streets are a bit odd...one ways with weird parking arrangements. Not bad as places in that area go. As I say, Bear was the first stop. That's not the way I mapped it out, but that's how it worked out because of the opening times. 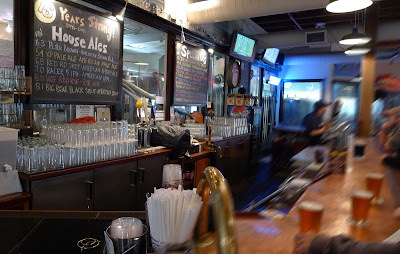 I liked the feel of the pub and the standard beers are terrific. The food was, as noted, not inspiring. At all. By the way, Bear didn't come in last on my list of the three pubs. You'll probably be surprised when you find out which pub did come in last. Coming soon. I don't think there's a single one-way street in this town... unless you count the alleys. 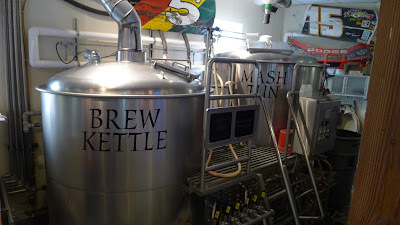 There is no "fake brewing equipment" in the Bear. It all gets used, just not all at the same time. They brew some of their beer at that location, but their bigger (new) production facility is located in Cloverdale, CA. My reference to one way streets may be inaccurate. I wasn't driving. But I had the clear sensation that the street arrangement was odd. I'll stand by that. The equipment they have near the bar clearly isn't "fake." I didn't use that term. It does appear to be mostly for show. I'll stand by that. I was unaware of a new production facility in Cloverdale. It makes sense. The Bear produces and distributes a lot of beer. I agree with Bill. All I remember from my visit to Bear Republic is being assaulted by Bear Republic advertising which is literally hanging from every wall and parts of the ceiling. Not an inviting place at all. The beer was pretty boring the day I visited - although I understand that is the roll of the dice as to which seasonals they will have on tap.